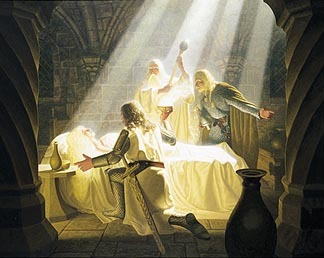 Painted for the 1977 Tolkien Calendar, this painting illustrates the fallen warrior, Éowyn as she is recovering in the Houses of Healing. Éowyn was responsible for destroying the Witch-king of Angmar during the battle of the Pelennor Fields (with the help of Merry the Hobbit). The battle left her severely wounded and plagued by the Black Breath. On the battlefield she was initially believed to be dead. Once it was realized that she did not perish in battle, she was rushed to the Houses of Healing. This scene depicts Gandalf and Éowyn’s brother, Éomer, watching over her while Aragorn heals her with a mystical plant called, Athelas, which is most powerful when used in the hands of a king. The rays of light shine down, illuminating everyone in this moment as the onlookers watch closely. Éowyn is peaceful, resting under the gentle and protective forces of her friends and family. Greg and Tim beautifully render this magical moment, illuminating the focus of the scene with exquisite lighting, gorgeous detail, and dazzling composition. It is as if the viewer is a spectator to this incredible moment. We are drawn right into this fantastic, magical world, and we cannot help but be filled with wonder.